While we’re still waiting for Android OS v2.2 a.k.a. Froyo to become officially available there are plenty of developer-intended devices around the globe that already run it. And as it turns out the latest version of the Android OS is way faster than its predecessor, the Eclair. Using the Linpack app, the guys over at the AndroidPolice.com have run a Benchmark test on a Froyo-powered Google Nexus One. An Eclair-based Nexus One and an HTC Hero were thrown in the mix too. The results sound more than exciting: the Froyo turned out nearly 5 times faster than the Eclair. 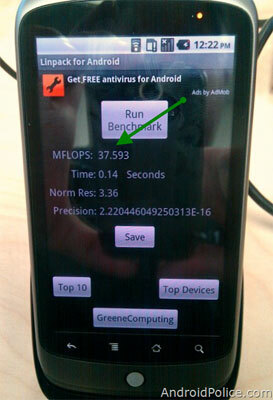 While the Eclair-loving Nexus One scored 6.5 to 7 MFLOPS, its Froyo-powered twin reached 37.593 MFLOPS. The Hero only managed 2 MFLOPS. I’m not surprised to hear that the Hero took the last place in the race. After all, the Nexus One packs a zippy 1GHz Snapdragon processor while the Hero comes with a much slower 528MHz one. While reviewing Nexus One’s brother from another father, the Desire, and the HTC Legend we ran some test too. You can check them out and see how the different hardware reflects on the performance of both Android-run smartphones.